RFID portals for doorways and corridors are used for the purpose of tagging things and articles moving through them. In various industries, tracking of assets through bottlenecks is an essential working through the system. An RFID technology works using electromagnets wherein data is transmitted by electromagnetic field to the reader from an RFID tag. RFID portals provide real-time, accurate tracked data for wheelchairs and IV pumps in large hospitals, office equipment in multistory buildings, pump equipment in far-flung oil fields and lot more. Ultra high frequency passive tags are used for pharmaceutical and consumer goods item tracking. Passive RFID tags are powered by radio frequency energy and have no power of their own. The radio frequency energy is transmitted from RFID antennas. RFID portals for doorways and corridors market are anticipated to record a CAGR of 5.6% over the forecast period. The RFID portals for doorways and corridors market are estimated to reach USD 17.5 million at the end of the forecast period. Many multi-national companies are concentrating towards new product advances in RFID portals for doorways and corridors. Moreover, the many advantageous properties of RFID portals for doorways and corridors are exploited in the field of security and quality checking now and then. New uses for RFID portals for doorways and corridors are discovered with product advancements which are expected to drive the RFID portals for doorways and corridors market rapidly. Currently the global RFID portals for doorways and corridors market are observing vibrant growth owing to increasing demand of tag scrutinizing in the market on account of increasing counterfeited products. Advances in quality control efforts in the past few years and growing technological explorations is projected to drive the market besides the wide range of functions of RFID portals for doorways and corridors in an immense range of products such as barcodes and security tags, travel documents, living being tracking, goods management and tracking devices and more during the forecast period. On the basis of regional platform, global RFID Portals for Doorways and Corridors market is segmented into five major regions including North America, Europe, Asia Pacific, Latin America and Middle East & Africa region. The rising demand for RFID portals for doorways and corridors for various processes in various end-user industries such as educational, healthcare, financial institutions, telecommunication, and others are expected to drive the market rapid over the forecast period. 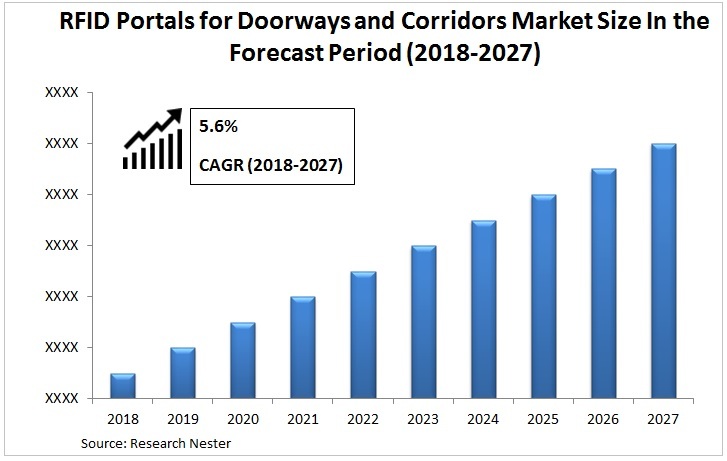 The growing R&D activity associated to RFID portals for doorways and corridors for new products and feature advancements is further expected to increase the market growth across the globe. Rapid industrialization is leading in economic development with thriving manufacturing sector is expected to boost the RFID portals for doorways and corridors market in the developing regions of the world. Moreover, increasing use of scanning of RFID tag for the data in growing retail and commercial markets is attributed to contribute significantly in the growth of RFID portals for doorways and corridors market over the forecast period. However, lack of knowledge about the application of RFID portals for doorways and corridors and low cost commercial projects leading to lower adoption of these in under-developed regions is expected to sluggish the sturdy growth of RFID portals for doorways and corridors market. GAO Tek & GAO Group Inc.